Varietats: Last Train to Helsingør by Heidi Amsinck - Blog Tour + Guest Post! 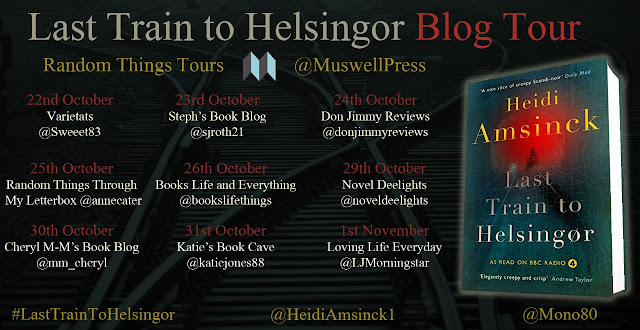 Last Train to Helsingør by Heidi Amsinck - Blog Tour + Guest Post! Scandi noir at its finest. This is not just a story, is a delicious compilation of noir stories; dark and full of shadows perfect to read this Halloween. Just one advice, be prepared for some sinister stories; super natural or human, no matter which one you start reading you will love it. Because let's admit it, who doesn't love a dark gothic tale? Reading these 19 stories will transport you to the scandinavian landscape, cold and twisty; but full of imaginary creatures that will make the delight to any adventurous reader. Here's a little extract of the book, to make you want to read it right now! An antique dealer arrives in Copenhagen by night to buy a Qing dynasty vase from a certain Mrs Vinterberg. To his cost, he finds that she collects rather more than antiques. “Roper was dropped outside an old building fronting the docks. It had a large wooden entranceway with a door set into it, and this door was ajar. On the other side there was a dank passage leading to an inner courtyard, its cobbles shiny with melted snow. There were many doors, but Roper followed the instructions the old Danish lady had given him and continued straight ahead, across the courtyard, to the door furthest away. Before entering, he craned his neck to see the sky framed in a dull orange square high above him. There was the distant rumble of an aeroplane. The lights went out on the second floor of the stairwell, and Roper was fumbling on the wall for the switch when the sound of a door being opened somewhere above him made his armpits prickle coldly. He felt quite sure that the vase was genuine Qing dynasty. Mrs Vinterberg had described all the markings and colours to him in great detail. Though, of course, as far as she knew it was worthless. ‘A common reproduction artefact. We see a lot of them in London,’ he had told her. vendor beware. Besides, ridding the elderly of their unwanted clutter was nothing less than an act of charity. Finding the light switch, he continued upwards with renewed determination, until he reached the open door. ‘Mrs Vinterberg?’ he called softly on entering. The hall had a chequerboard floor and wall lamps set into wood panelling. Roper felt as though he had stepped on board a ship, one of the old-fashioned classy liners. ‘Hello? Anyone here?’ he said, only to jump at the door shutting with a heavy clunk. Then came the peculiar guttural accent he remembered from the telephone. Mrs Vinterberg – a tiny, breakable thing of at least eighty – had been in the hall all along, hovering behind the door. She was dressed eccentrically in a long sequinned caftan with a turban made from colourful silks, and had mournful eyes and waxy skin. Roper towered over her as she spoke. Without waiting for a reply, she led him through to a cavernous lounge. Roper had to stop in the doorway and steady himself. On every vertical surface there were framed paintings and sketches and photographs. Oriental rugs covered the floor and there were several sofas, tables and gilded lamps. He wondered how many objects he could fit in his suitcase besides the Chinese vase. took a big mouthful but almost spat it out again. ‘What’s this?’ he said, frowning as the hot liquid slid down his throat. It had an aftertaste that was at the same time sweet and unpleasant, like bitter almonds. 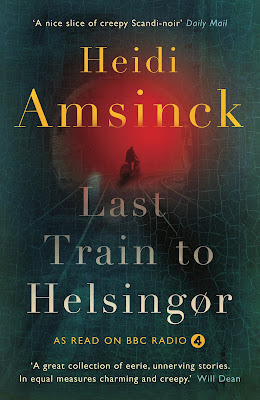 Heidi Amsinck is a writer and journalist born in Copenhagen. She has had many stories commissioned for radio but this is her first published collection. She was previously shortlisted for the VS Pritchett Memorial Prize. She writes in English and lives in Guildford, Surrey.